Jamie Oliver has his cookware, Paul Hollywood has his bread mixes and now Mary Berry has her cakes! We are getting accustomed to TV celebrities launching their own version of this kitchen utensil or that cooking item. They are all at it. Even Loyd Grossman has his sauces and he isn't even a chef! Well now it's Mary Berry's turn with cakes that are to be launched on to the 'gullible' public food market. 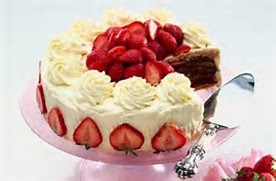 Mary Berry has been brought in by bakery firm, Finsbury Food Group to release a range of her cakes. The 81 year old former Great British Bake Off judge is launching nine cakes designed in collaboration with the baking giant, Finsbury, which supplies stores across the UK. The 'unique' cakes will cost from about £3 to £6, and will include round cakes, loaf cakes and celebration treats. 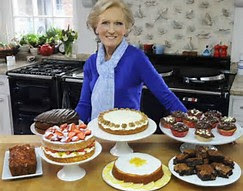 The Chief Executive of Finsbury, John Duffy, is reported to have called Mary Berry an 'icon in baking'. 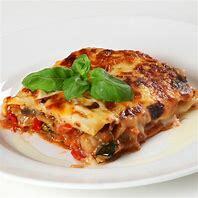 He says that a lot of people watch the Bake Off programme and are interested in baking, but may not have the time or skills, and so this will bring Mary's treats into their life. What an understatement, I say! I've always said that folk may watch the Great British Bake Off but few are encouraged to bake cakes themselves. Now they can have a Mary Berry cake without lifting even a wooden spoon. Mary's cakes will appear on shelves by the summer and Finsbury will hope to boost their sales which have remained flat for 12 months now. I am sure that Mary Berry cakes will help them win a bigger slice of the market, as we all rush out to buy. I only hope there's Mary Berry Lemon Drizzle Cake!